I’ve been on a Skyfall kick lately, so for the 007th of March I’ll once again be breaking down a sequence from James Bond’s latest cinematic adventure. Continuing in order from where we left off in London, I should technically be writing about his swimming trunks in the Shanghai hotel*. However, I would feel awkward screencapping that so we’ll move right along to the next scene. * If you actually are interested in what swimming trunks he was wearing, they are a pair of light blue Orlebar Brown Setter Sky shorts with a very short length and adjustable sides, recalling the similar blue shorts worn by Connery’s Bond in Thunderball. Earlier this week, I posted about the reefer coat worn by Michael Caine in The Italian Job. The reefer was traditionally a high-fastening, double-breasted, dark navy wool coat worn by seamen. Nearly 300 years after their conception, reefer coats – also known as pea coats – are still popular today as winter outerwear for military and civilians alike. Caine’s coat in the 1969 film was a very modern (for 1969) update made of brown suede and featuring very contemporary trends. 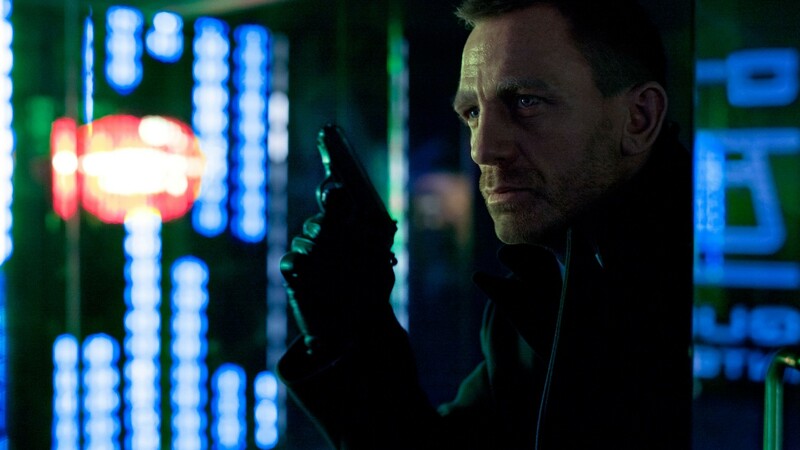 Daniel Craig first introduced the pea coat as part of James Bond’s on-screen wardrobe for the opening sequence of Casino Royale, but it is Skyfall where the coat is truly showcased. Given Bond’s naval background, a classic-looking navy pea coat is a very logical choice for a casual winter jacket. Another one of Daniel’s ideas: When he’s playing the chauffeur in the airport, he was the one who said, “I want to have a blue peacoat. I know Billy Reid makes very nice ones.” So I ordered ten pieces, and I must say, they put this little piece of leather on the back and it is beautiful. And paired with the chauffeur hat he’s wearing, it gives Daniel a sort of boxy look. Bond and a Billy Reid. Craig himself ordered a Billy Reid pea coat post-production, and his choice of a size large indicates which scenes he preferred shooting in the coat. This is further indicated in the film itself, as Bond only buttons the center button as it would probably be too tight to move with all of them buttoned. The single rear vent also aids movement, as it would be difficult to move if the jacket was ventless. It would also be difficult to do stuff like this. Billy Reid’s site has offered the coat again on its site (and Amazon ) for a cool $695. Given the necessary quality of a good and fashionable winter coat, this may just be worth your money. However, the coats used in the film were 100% wool while the newer run are 80% wool and 20% nylon. The coat is also unlined with cotton-bound seams. Putting a contemporary twist on the classic pea coat, the Italian-made Billy Reid coat has a 6×3 double-breasted front, simpler than the 8 or 10-button varieties offered on most military pea coats. The buttons are brown natural buffalo horn, unlike the usual black plastic buttons with anchors on them. It has peak lapels with dark brown leather accents under the collar and underneath the pocket flaps. The hip pockets are flapped with a concealed button on the leather under each flap, but the vertical slash “hand warmer” pockets on the chest are open. Bond stores his PPK/S in one of these chest pockets before he (literally) jumps onto the elevator. Due to their short length, pea coats are not typically worn with a suit, thus making them more informal by default. Bond skirts this issue by pairing his Skyfall peacoat with a sweater and necktie rather than a suit jacket or blazer, which would look sloppy and feel clunky. Bond looks very slick in this ensemble as he weaves his way in and out of a high-rise office building in Shanghai. I’ll admit I was a little surprised that there wasn’t a drink on the bar in front of him. The sweater is a black John Smedley “Bobby” v-neck pullover jumper made from 30-gauge extra-fine New Zealand merino wool. The v-neck is deep enough to show off the tie, but not quite so deep that it’s quoting Sylvia Plath. The cuffs are gently turned back, allowing Bond’s shirt cuffs to show. It is another classic item, and the official John Smedley site is still offering it in 11 different colors for £130. (Naturally, Amazon ‘s also got you covered.) The other colors range from Papaya orange (eh) to midnight blue (ooh); the latter would be a very Don Draper-ish item if you’re in the mood to pick up extra Smedleys. The white cotton shirt underneath the sweater was made by COS and has a slim spread collar and buttons down a plain front with no placket. Unlike Bond’s other Skyfall dress shirts, it has rounded single-button cuffs rather than French cuffs, but this is the appropriate choice since it’s a more informal outfit. It is still available on the COS site for £45. Bond takes a quick break from secret agenting to check his Facebook. Bond’s slim necktie, also from COS, is black woven silk. COS still offers ties on its site, for only £29, but I’m not sure if any are specifically the Skyfall tie. Bond’s flat front trousers are a pair of “shark gray” – actual black and light gray weave – wool trousers made by Acne Studios for their “Wall Street” line. The trousers are very slim, as one would expect of Jany Temime’s Skyfall costuming, with a high rise and a tight fit particularly around the legs and waist. They fasten on the extended waistband with a double button and a hook-tab closure over a zip fly, with adjustable tabs on each side of the waist most of the Connery trousers. The trousers have four pockets, but not in the traditional layout: two front pockets, a coin pocket under the right front waistband, and a button-through pocket on the right rear; there is no left rear pocket. The bottoms of the slim legs are plain-hemmed, breaking short over the shoes. The trousers are still available on Acne’s site for €220. James Bond Lifestyle also has more information about these trousers. 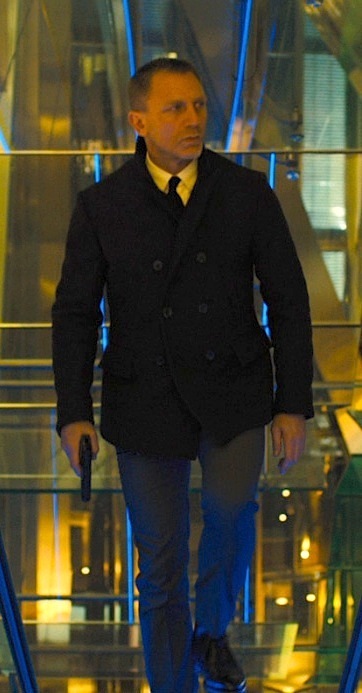 Bond wears a pair of black 2-eyelet Crockett & Jones “Tetbury” chukka boots, made from antique nubuck with the renowned Dainite rubber soles for additional traction during action scenes. Crockett & Jones still offer the boots for £355, and James Bond Lifestyle features more information and photos for your perusal. If the Tetburys look familiar, it’s because Bond also wore them previously with his gray suit in Istanbul. He wore the Highbury model, a more traditional derby, for the London suit scene just prior to this which required less stunts and thus made a more traditional dress shoe more appropriate than the boots. For an additional level of professionalism, Bond wears a pair of black unlined leather gloves from Dents, which go for around £65 on the Dents site. The product code for the gloves just happens to be #5-1007, according to James Bond Lifestyle. Bond Lifestyle also organized a “Super Contest” last December, offering a main prize of a framed pair of Dents gloves and photo signed by Daniel Craig. Online shoppers who missed the contest can still check out Amazon for a pair… although I doubt Dan Craig is sending any autographed pictures from there. The filmmakers obviously knew how badass Bond looked in his black leather gloves, made evident by the prominently featured Dents gloves in the first photo officially released by the production. Naturally, Bond also wears his trusty Omega in Shanghai. It is the same Omega Seamaster Aqua Terra Mid Size Chronometer he wore in London, with reference number 231.10.39.21.03.001. It has a stainless steel case and bracelet and a blue dial with a date indicator at 3:00. This is the watch he wears for the majority of the film, up through the finale. Omega. Good for sneaking around places where you shouldn’t be. Bond completes his Shanghai ensemble by converting it into a chauffeur’s uniform to disguise himself at the airport. He adds a traditional black chauffeur’s peaked cap, but the coolest part of the disguise is a pair of Tom Ford Marko TF144 “18V” aviator-style sunglasses with silver rhodium frames and blue lenses. If you have an extra $200 laying around, you can pick up a pair on Amazon . Despite the new Tom Ford-James Bond association, the sunglasses are the only visible Tom Ford item he is wearing (since I can’t attest to the maker of his underwear or socks). Bond tries to make it a little less obvious that he can’t blend in in Shanghai. Bond evidently carries his sunglasses to the Macau casino, since he has them on hand when meeting Silva the next day. But we’ll get to that later. Bond says about six words in this whole sequence, all of them demanding information from a man who is about to fall about 2,000 stories to his death. Avoiding the urge to be blabby, Bond’s quiet efficiency from the airport to the office building is evocative of some of the silent killers from early films like From Russia With Love, Goldfinger, and Thunderball, where the quietest men was Bond’s deadliest enemies. A major takeaway here is that it’s possible to do something without providing a running commentary. Two Steve Buscemi characters failed this test of laconicism and ended up either going through a woodchipper or suffering from a heart attack after a confrontation with German nihilists. That being said, these scenes coincidentally also showcase Bond’s product placement-guided choice of cellular communication in Skyfall, a Sony Xperia T.
Those magnificent bastards in product placement have done it again! Upon its reveal in 2012, the Xperia T was even described by Sony as “the James Bond phone”. This sort of cellular marketing is nothing new to the Bond series, dating back to the Ericsson “JB007” offered around the release of Tomorrow Never Dies in 1997. With the introduction of the Xperia T, Sony also developed the special Xperia T “Skyfall Edition” for the UK market with some preloaded Skyfall-related stuff for users like a ringtone and 007 images. There’s nothing overly Bondian about the new phone; it doesn’t have a laser or anything like that. Thanks to the Internet – James Bond Lifestyle to be specific in my case – we can identify nearly every part of Bond’s outfit here if you want to recreate it on your own. However, Bond’s budget is a bit more inflated than most people’s, so if you pay attention to the details rather than the brands, you have a nice shot of Bonding yourself on a budget. I couldn’t help but to include this. 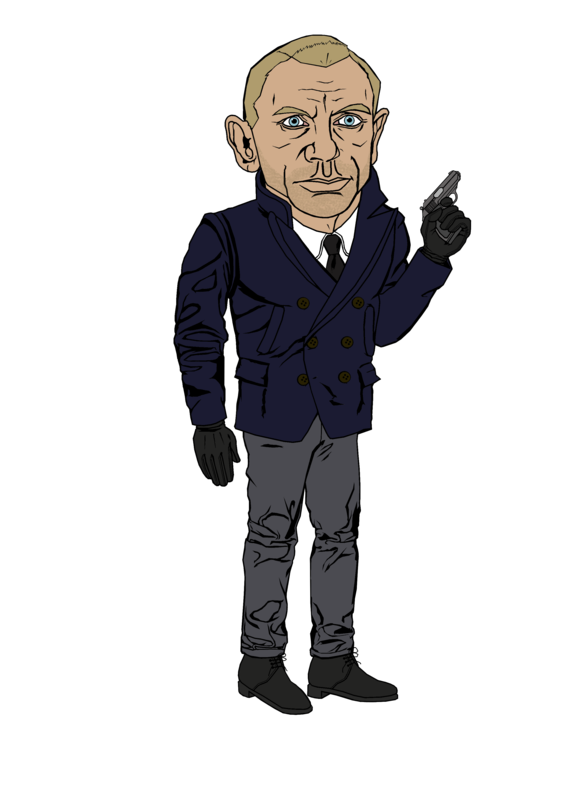 Brady Major at DeviantArt.com created this pretty accurate caricature as Daniel Craig, even nailing the details of the pea coat and trousers. Bond wears a Billy Reid “Bond” peacoat, set apart by its brown horn buttons and dark brown leather accents under the collars and pocket flaps. $695. Bond wears a John Smedley “Bobby” sweater. $230. Bond wears a COS shirt. $75. Bond also wears a COS tie. $49. Bond wears Acne Studios’ “Wall Street” trousers in shark gray. $280. Bond wears Crockett & Jones “Tetbury” boots in black wax calf. $600. Bond wears Tom Ford Marko TF144 “18V” sunglasses. $200 . If you were doing the math, you can accurately replicate Bond’s look for just over $2,100… given that they have your size in stock. Since Bond’s clothing immediately becomes the most in-demand menswear for years, you may face a few hurdles there. Iconic Alternatives has a great rundown of affordable options to channel elements of this popular look, such as the dark pea coat, gray trousers, the Crockett & Jones chukka boots, and many other 007 outfits. I have personally tried a similar look wearing a military surplus Schott 40-N naval pea coat, a black Italian merino wool v-neck sweater from Express, a white Express 1MX shirt, a slim black silk tie from H&M, dark gray herringbone trousers that are part of a John Alexander suit from the ’80s, and black leather Chelsea boots from Timberland. It’s a relatively budget-friendly combination (except for the surplus pea coat, which was a lucky hand-me-down), especially when compared to the high prices of Bond’s attire. While I haven’t leapt on elevators or fought hand-to-hand next to an open skyscraper window, I can attest that is a comfortable outfit that adds a level of class to a casual look, further enhanced with a blued .380 in the coat pocket. Remember when Bond got that custom-designed “Walther PPK/S nine-millimeter short, it’s been coded to your palm print so only you can fire it” from Q? Well, you should because I wrote about it in my last Skyfall post. Bond takes the Walther along to Shanghai, keeping it tucked into one of the chest pockets of his pea coat when he’s not using it. Anyone ever play laser tag? Remember how when your laser gun was fully charged it would light up and you’d hear that ZAP in your headset? *crickets* No one? The “Chekhov’s PPK” rule doesn’t come into play here, as Bond is the only one using his gun so the palm print reading gadget is just a novelty rather than a plot point. It will, however, save his life in the next scene at the Macau casino. Buy the movie . You can also easily buy the components that created this outfit online, but have a little fun seeing if you can go through your own wardrobe and put something similar together. And don’t worry if your PPK doesn’t have a palm print reader; most of them don’t. Tons of help, as usual, came from James Bond Lifestyle, a definitive resource for identifying and obtaining the same brands worn by Bond. This is my favorite outfit in the entire series of Bond films. I fall into the group that feels Daniel Craig’s suits from Skyfall were too close fitting and looked bad, however, since this outfit is less formal, I have no objection to the snug fit. David Zarinsky has a very good review of the Billy Reid peacoat posted on You Tube. Cool coat, but I’m not a fan of unlined outer wear. Another terrific post. I second this. Really tight clothes are our generation’s bell-bottoms and big collars/lapels. 1) I very much like it when you post alternatives to the “screen correct,” items, since most of us can’t afford that stuff. 2) Since Casino, I really feel that Bond has been eclipsed by Bourne. Yes, you don’t get one without the other, but I don’t drive a Model T today either. Assassins and spies want to blend in, not stand out, plus we’re out of cool things for Bond to do. Everything in Skyfall was a more or less a rehash of something from another Bond film and when the franchise starts referencing it’s own agedness, “on screen,” it might be time to hang it up. Jimmy – thanks for the kind words! Have your received the jacket yet? Hey, it’s Brady Major. I was just running through Google and saw you’d used my artwork on this page. I really enjoyed the costume design of Skyfall and am happy that my representation was good enough that you thought it’d be a nice accompaniment to your article. I really appreciate that you credited me as well. Cheers. I purchased a terrific black pea coat from Yoox UK last December. Its from Gerarld and Stewart USA who were traditionally outfitters to the US Navy. It was described on the Yoox website as a 3/4 jacket and it was only £97, best purchase ever made! £97 is a fantastic deal for a pea coat, especially one likely made the military specs like G&S would. Having worn both a military (Schott) pea coat and a few “designer” models, you definitely notice a difference and the military-inspired or military-issued always wins out. You’ll definitely be comfortably warm this winter! what would you estimate as the length of his peacoat? where the bottom fall? An inch below the sleeve cuff?